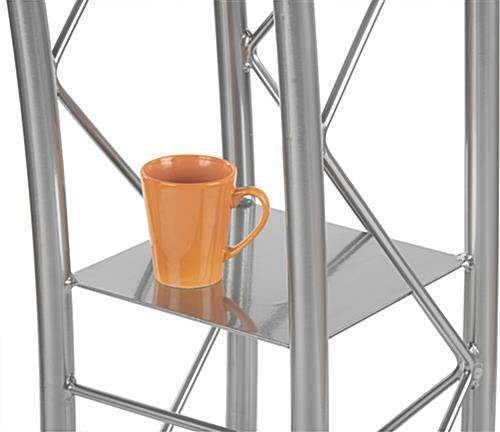 45-1/2” Tall Stand for the Average Person’s Height. 23-1/2” Wide Top for Spacious Reading Room. Curved Design for a Contemporary Appeal. 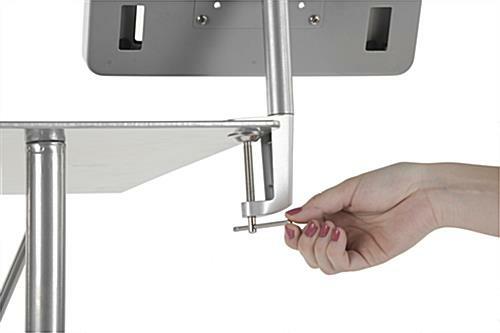 Tablet Enclosure Fastens by Clamp onto the Edge of Podium. 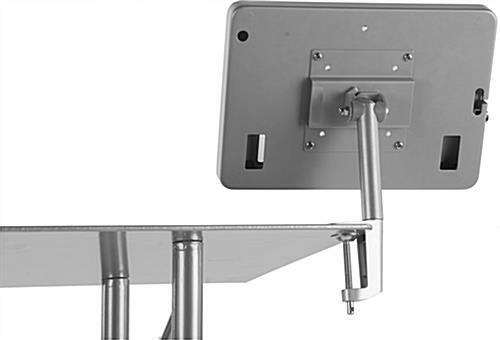 Rotating and Tilting for Alternate Viewing Angles. Locking Enclosure and Exposed Home Button. 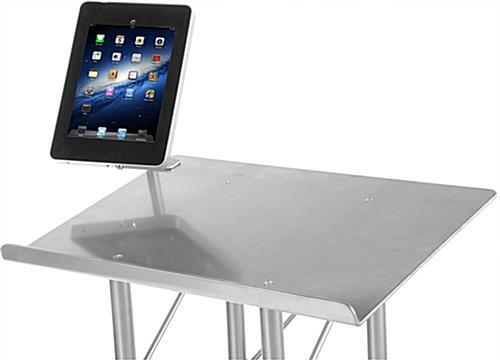 Accommodates Generations 2, 3, & 4 Apple® Devices. 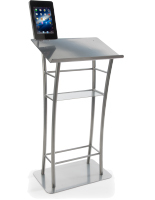 This iPad floor lectern is a leading-edge design that combines digital and print format into one stunning, interactive display! 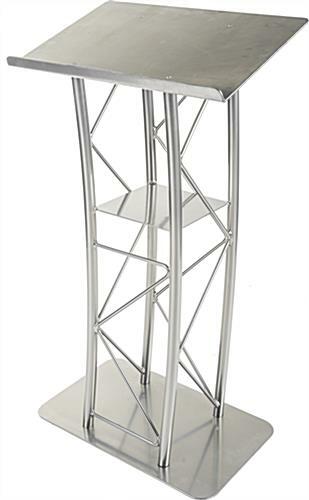 Each tablet stand is 45-1/2” tall to correspond to the average person’s upright posture for a comfortable presentation stance behind a contemporary truss design. 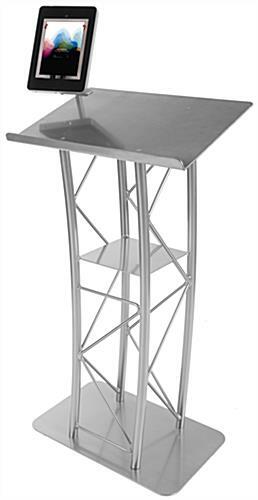 The top of the aluminum floor lectern has a reading space of 23-1/2” for enough room to organize notes and other literature pieces into a tidy display and within accessible reach. 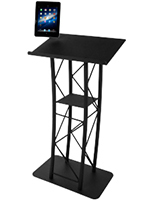 Uniquely, this stand includes a tablet holder with purchase that has an exposed home button for access to software applications that clamps to the edge of the podium’s tabletop which transforms it into a multimedia design. 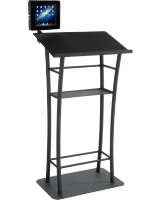 The iPad lectern is a locking enclosure to ensure that unauthorized users cannot tamper with software applications and presentations. 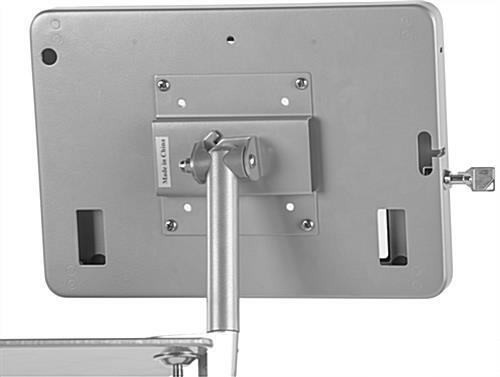 Also, each bracket can adjust to different speakers’ preferences by tilting and rotating into suitable positions. The holder accommodates Apple® generations 2, 3, and 4.